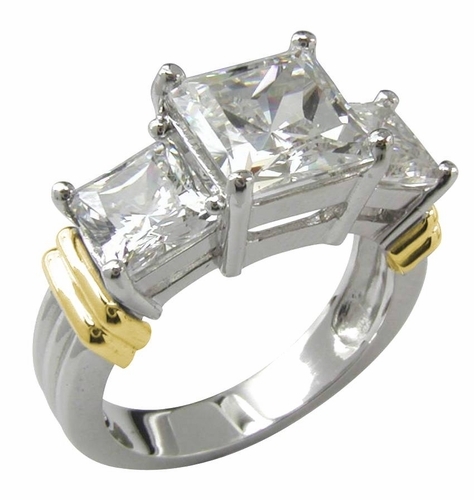 The Two Tone 2.5 Carat Princess Cut Cubic Zirconia Three Stone Anniversary Ring features a 2.5 carat 8x8mm princess cut square cubic zirconia center with a 1 carat 6x6mm princess cut square on each side. The ring includes double bands of 14k yellow gold and a ribbed detailing that continues down the shank to complete its look. 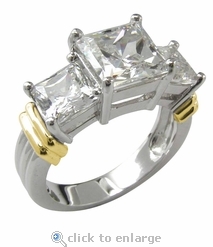 This ring has a gorgeous look it and has a nice and heavy mounting with some serious brilliance. This engagement ring includes a total weight of 4.5 carats in total carat weight. We offer a similar wedding band that customers have chosen to compliment this solitaire, please see item R1705. Due to extremely low pricing, all clearance sales are final.